Babalawo Awotunde Ayodele (Baba Eli) is a Yoruba Ifa Priest and Priest of Oshun initiated at Ola Olu by the Ifa Foundation International, Inc. His spiritual journey and education has given him a very broad spectrum and well of knowledge to draw from in order to enhance his practice of Ifa. Baba Eli is a Wiccan Priest as well as Usui Reiki Master/Teacher. He is a Nurse and Shamanic Practitioner. He is also knowledgeable in Southern Folk Traditions. 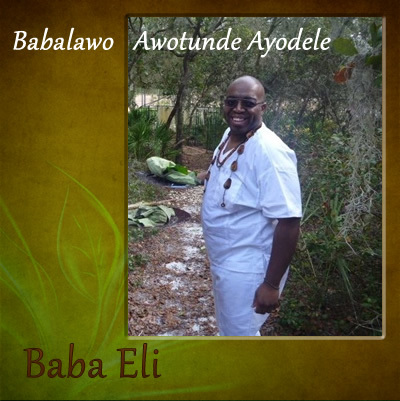 As previously mentioned, all these things combine to give Baba Eli a wide range of knowledge and experience to draw from in order to enhance his knowledge and practice of Ifa. All he has learned has become part of him, but it Is The Orisa and Ifa which are his life’s blood and his passion. It is a heartfelt desire to help his fellow man be and do the best he/she can in accordance with destiny which drives him.